None of the vendors included in the first Wave made it to the current one. Six out of 23 vendors were included for 3 or more consecutive years. 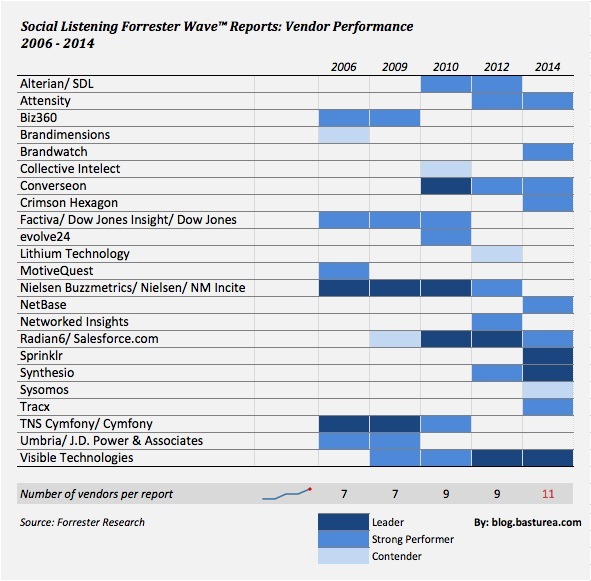 In February 2013, Forrester analysts Nate Elliott and Zach Hofer-Shall made a bold prediction — that the social listening category will die in the next 18-24 months (original research – free with registration here). For now, the last Wave includes the largest number of vendors so far (11). Let’s revisit this forecast in September 2014.